Greywater systems take our soapy sink, shower, and laundry water and transforms this “waste” water via mechanical filtration and chemical biodegradation into purified and nutritious food for some of our plants and animals that in turn feed us. This short essay highlights how greywater systems can transform our undesirable waste-water into nourishing food for our dinner plates through the use of micro and macroorganisms, plants, and animals. The first example of a more traditional type of greywater system is explained before much more concise, but no less interesting examples are introduced. The household greywater is first fed to a settling tank containing water where solids are separated from the accompanying liquid. We then pipe the effluent through pipes which then flows into a recessed area in the ground called the Greywater Treatment Wetland (GTW). A thin base layer of sand is covered with a thick layer of gravel followed by a thin layer of organic top soil. 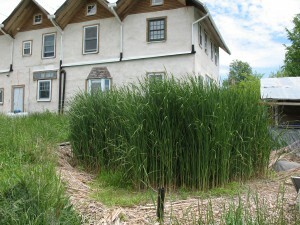 This shallowly depressed and slightly inclined biofiltration area removes a significant amount of impurities by providing the function of finer physical filtration via the presence of the sand, gravel, and organic matter layers, and the first stages of biodegradation through the presence of a wetland plant such as cattail. Cattail was planted here because it generates an abundance of oxygen which then is available to microbes who utilize it to biodegrade pollutants and assist in the biotic breakdown of organic materials. Since greywater is fed via the subsurface to this wetland, there is much less concern for mosquitoes taking up residence at this location. Our GTW is round in shape with a diameter of approximately 20 feet, though they typically range in size and shape in accordance with use and desired aesthetic result. Remember we don’t have black water which would be the equivalent of sewage water, because we use humanure composting. Aside from keeping toxins out of our greywater pond, this significantly reduces the water flow that would burden the system otherwise. The water is then piped through a vegetated area before descending upon the main body of water, the greywater pond. Ours is appropriately called the Cattail Pond. This pond is rich with microorganisms that gorge on the particles of our food waste from dish washing. Simultaneously, they are breaking down all the other particles present as the result of laundry washing and showers. As a consequence of the presence of nutrients and other biodegraded products, our pond is covered with a tiny plant called duckweed. It is often mistaken for algae, but is actually the smallest blooming plant at only 2 mm. It works overtime removing excess nitrogen and phosphorus from the water, and does not degrade the water as algae sometimes does. We actually skim this incidental byproduct of water purification and feed it to our chickens, mixing it with locally grown chicken feed to produce delicious eggs, and sometimes meat. To me, skimming the duckweed off of the Cattail pond while rowing in a canoe is my absolute favorite “chore” to do. It’s a delicious representation of how food can be produced from waste products instead of consuming resources most likely produced through the use of fossil fuels. Another example of a highly functional use of greywater is Ted and Sara’s system. They pipe their greywater into their greenhouse, reusing precious resources to sustain plants that will in turn sustain them. The excess is then piped away from the structure in order to then percolate back into the ground and nourish native vegetation that in turn acts as a filter. A third and final example of a greywater system that can be incorporated into the food chain is a branched greywater system. These systems have multiple divergent pipes that carry the water to where you need it, such as to multiple trees in an orchard. This not only saves labor and provides water, but the nutrients and their respective microorganisms create microcosms of biodiversity while essentially making plant food that is more bioavailable for the trees. This is suited best for perennials, and can’t be used for the entire life of annual gardens as this water shouldn’t be used on young plants. We hope that you can also get creative with ways that you can reuse what is generally thought of as waste, and find a use for it in a way that increases your bounty, and decreases your workload and personal expenditure. An increase in personal satisfaction is well worth the efforts put forth to implement one of these systems.